Social media is built for video trends. That's been the case all the way from the agonizingly long Harlem Shake trend to now, as we are enduring a new video craze: the drive-by-dunk challenge. The Celtics have always seemed to find a way to dip their toes into these social media movements. Fans saw it with Rajon Rondo, Marcus Smart, and Kelly Olynyk, all the way up to Danny Ainge and Wyc Grousbeck during the ice bucket challenge craze a few summers back. 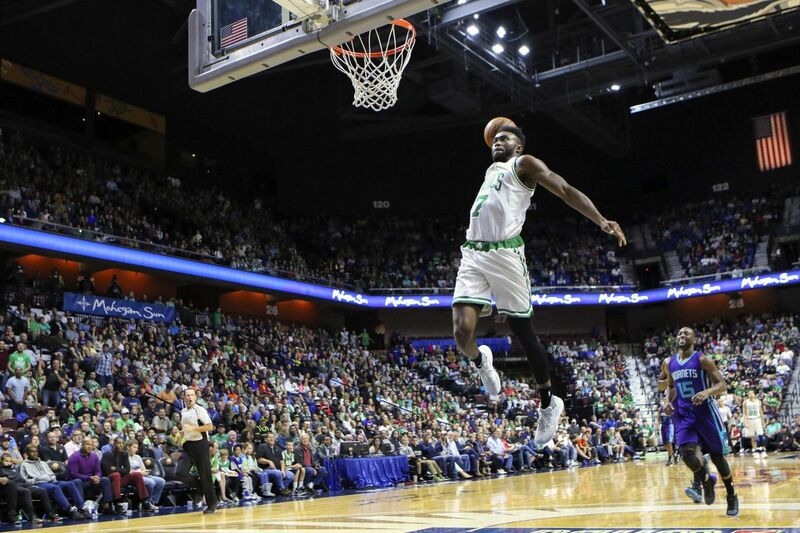 Now, current Celtics are throwing down in their own renditions of the drive-by-dunk videos. Most recently? Jaylen Brown. Firstly, do you think those kids knew that was Jaylen? He was in and out in a flash, and who could possibly expect the dude that just swiped their basketball and then rattled the rim like a kid would on a Little Tikes hoop was an NBA player? I sure wouldn't. Still, I really hope they see this video and realize a future NBA star was just in their midst and all they could do was be upset that he took their ball for three seconds and slammed it home like a boss. Follow Topher Lane on Twitter, @Topher_L. Photo credit: Wendell Cruz/USA TODAY Sports.